It was not even remotely a surprise to Dave and I when, at the end of the day last Monday, the crew was still not finished. However, they had completed the stairs to the second second floor (excellent job José! ), attached the front porch rails, put in the fixed widows in the great room, as well as the heavy detail on the roof trim. Dave stayed long after the sun had set and they were still working on laying the last layer of roof felt, in the dark, using their iPhones for light! Heavy rain was due to set in the following day so it was imperative that they get the felt down before they quit for the night. our new wall of windows! I drove down Tuesday morning, expecting the crew to be finishing up and leaving that afternoon, and I wanted the opportunity to say goodbye and to thank everyone for all their hard work. The rain had already begun and there was a bustle of activity inside and outside when I arrived. It seemed clear to me as soon as I arrived that there was still way too much left undone for them to really be leaving that afternoon. However, I knew that even if José and his crew didn’t leave, Mr. Lipham still needed to leave by the end of the day in order to get home to his family in Tennessee in time for Thanksgiving. Shortly after I arrived, it was discovered that they were 150′ short of roof flashing and asked if I’d run up to Home Depot to pick some up. Not a huge deal, but the closest Home Depot is thirty minutes back in the direction I’d just driven from. By the time I drove up there, bought the flashing and drove back to the work sight, I knew I’d have to turn around and leave as I had to get home to start prepping for our own Thanksgiving festivities. So much for my thoughts of hanging out to get a group shot of the guys and to say a formal farewell before they wrapped things up and pulled away. There was such a storm of activity inside when I got back, as the crew worked to get things finished, that I felt I was in the way, so, I just snapped a couple of photos, expressed my thanks to Mr. Lipham, wished him a Happy Thanksgiving and off I went in the rain. Dave went down later that afternoon, after I left, and was able to get the guys to pause for a moment to snap a group shot of the guys on the front porch with his iPhone shortly after he arrived. (You can see in the photo that the rain was pretty heavy at this point.) Regrettably, I had chosen not to leave my camera down there for him to use when I left, so the photo was not the great shot I had hoped for. Still, I’m glad he took it as it was better that not having taken one at all. As he left Tuesday evening, they were still working on putting up the railing on the deck, again in the dark, this time using a flashlight that he had happened to bring along. Mr. Lipham did go ahead and take off so he could get home in time for the holiday leaving José and his J. M. Log Craftsman crew behind to finish. they had run out of 8 x 8s for the rail supports, so took left over log ends and cut them down to fit! Dave went back down for a short time Wednesday to find them working away diligently in the heavy, cold rain, pausing every now and then to try and dry their coats by the fire. They worked through the day Wednesday and finally finished on Thanksgiving day. Needless to say we were not there to witness them wrap things up and to wish them well as they drove away. Such an anticlimactic ending to the dry in phase of this building process. Mr. Lipham and Andy will be back in a few weeks to finish up the wiring and staining and to put in the basement windows that had to be reordered as the ones that had been sent did not fit properly. We went down after Thanksgiving to check things out and, as we walked through the place taking in all of the details, we couldn’t have been more pleased. 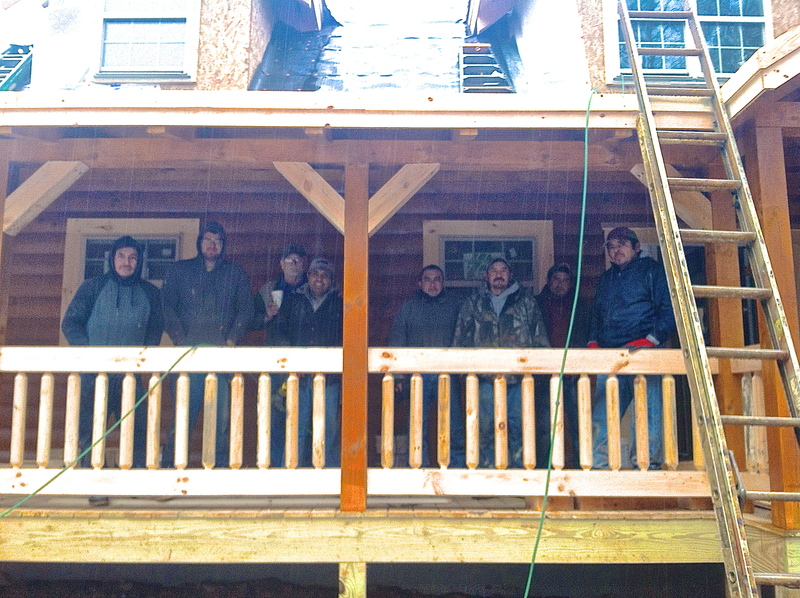 It was such a great experience dealing with Mr. Lipham, José and the rest of the J. M. Log Craftsman team ( http://www.jmlogcraftsman.com/ ) and we can’t even begin to express our gratitude and appreciation for all of the effort that they put in to building our home. the cabin has been duly christened! So awesome! I want to go to there.